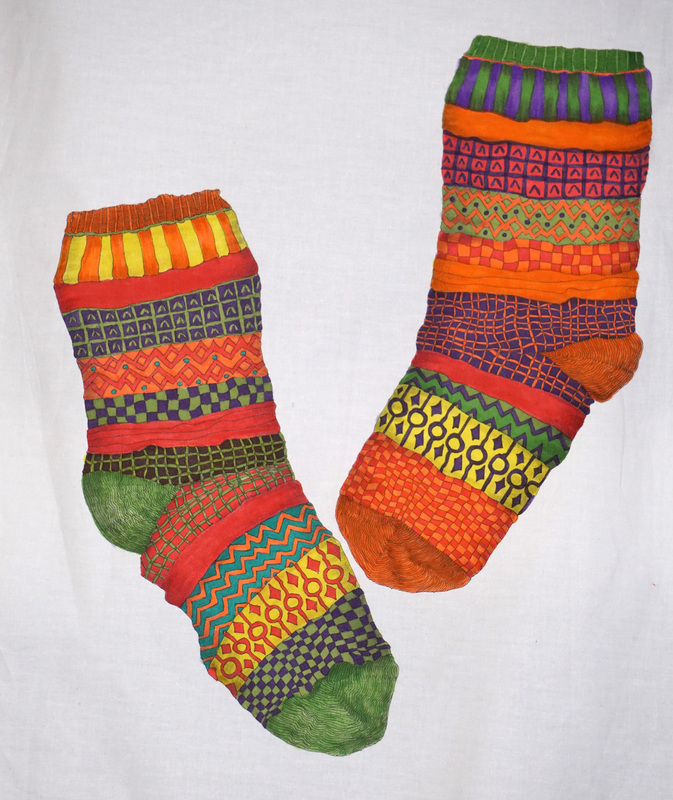 Sockittome – the challenge. The sock are done, now what? This is the picture I began with and the challenge is to create a quilt using this image. As I mentioned previously I considered doing them the same as the photo. I was going to appliqué each color and illustrate on the appliqué. But I decided against it and previous posts share the reasons why. Sock no 1. was completed and illustrated last week and I finished the other today. They are drawn and illustrated on white fabric.. There are a few techniques that I use for the illustration. This is the finer pen end of the same pen. Some of the images in this drawing are really quite small and even the pen end of the fabric pen is a bit bulky for a fine finish, so I use a different pen. A faber castel Pigment ink pen. This is a much finer brush, its lifespan isn’t as long the Fabric pen but for this project, it worked well for all this tiny little images. The pens are a little like using a water-color brush, If you want an effect that is flat color instead of a sketched effect you need to continue doing the entire strip before finishing otherwise you will end up with a start and stop point in the middle of the drawing. For instance on this part I could stop and start on the triangles and on the top of this strip, but I had to do the zig zag row without taking the brush off the fabric. The photos are a little confusing because this brush is actually only about 1/4″ long and very fine. The Fabrico one is about 1/2″ long and thicker. 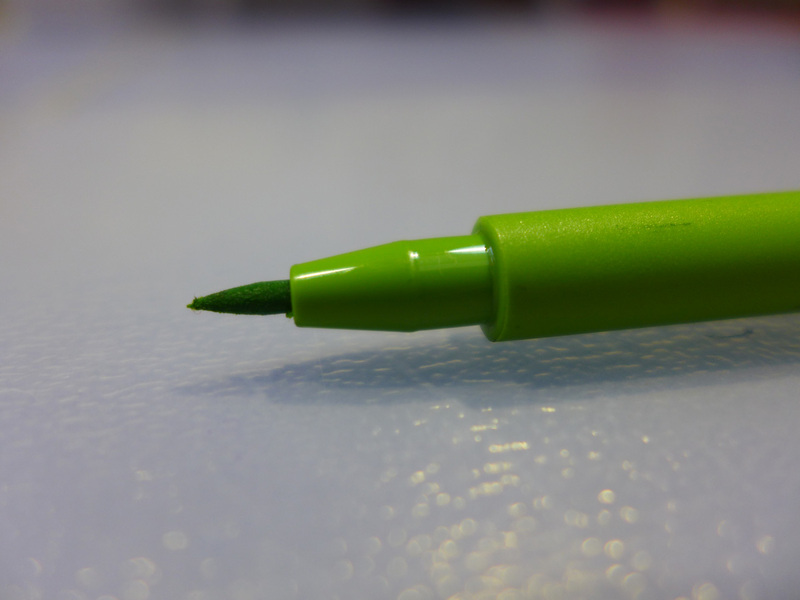 You can also use a Zig pen, but I find the brush end a little firmer that the pliable Fabrico one. 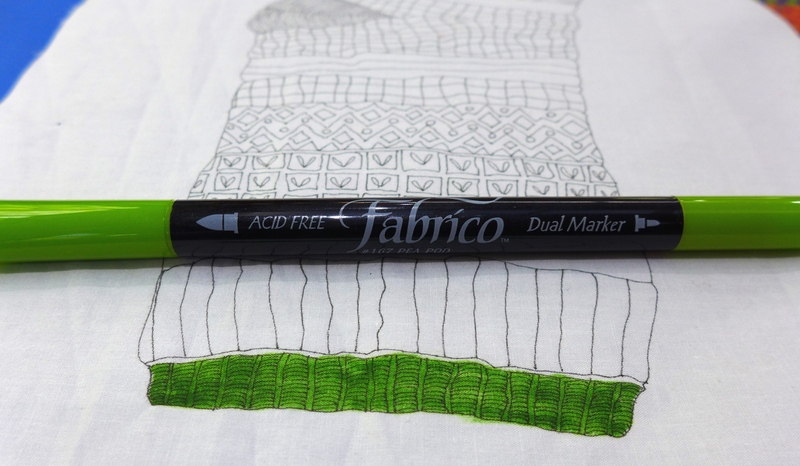 If you have markers at home and even if they say they are for fabric, I’m going to ask you to smell them. If they smell like methylated spirits… they are not permanent and will bleed if they come in contact with water. Pigment ink is permanent and can’t be washed out. The manufacturers ask you to iron the image after you have drawn it… but I find once they are on the fabric they will never come off even after dozens of washes. Trust me I know…..!!!!! Another hint for completing the illustration, if you look at the larger image it appears that the socks are dimensional. I achieved that by softly (just kissing the fabric with the pen) colouring the sides of the sock with a grey pen to look like a shadow. You know anyone can do this, its really just a colouring in technique. 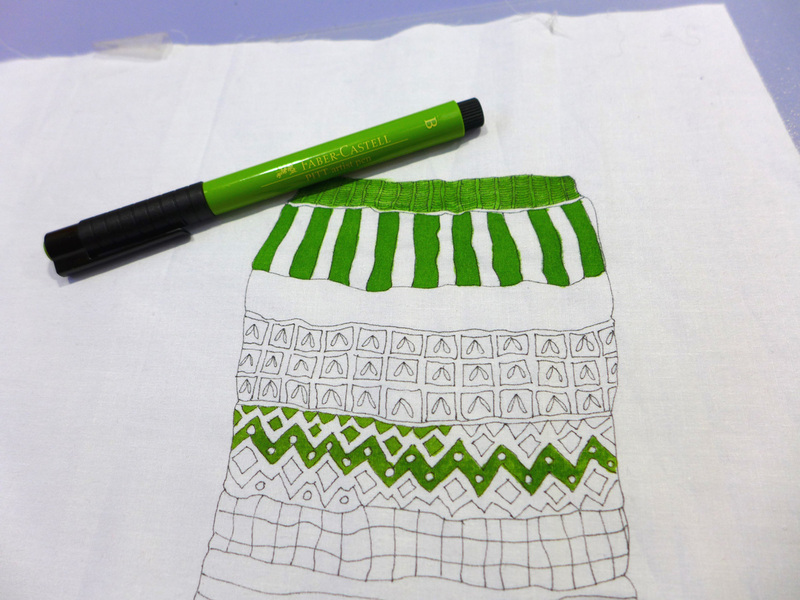 Colouring in on fabric is sometimes easier than on paper. I’ll do a small video and show you. So the socks are done. I’m going to cut them out to appliqué them onto the background and I have some ideas I need to audition first before I tell you what I’m going to add. However, I want to scan them first on a large scanner so I can print send the image to a fabric printer and create some prints. I’m going to print them on linen so they have texture and put them on a cushion… strange I know. So it will be a day or so before I get back to them. However, tomorrow I will share a few other ways I illustrate on fabric. I do appreciate the time and care you have given in taking us through your thinking and techniques used for this piece. The insight is so generously offered over many days and Is really valuable. I know you intend to help your readers find freedom and new approaches in their work and I’m sure others would join me in testifying to your success in this. I admire, and am grateful for, your commitment to sharing your art and artistic process. Sincere thanks. I look fiward to each new post, which I read avidly. Ann, Thanks for your comments, The process is often more exciting than the finished project. We always see finished quilts, but the process is often left to wonder. Hi, Pam this is Becky from Bastrop, your offical IQF Houston groupie. I check your site and blog atleast every other day and never fail to be inspired. Not only by your work, play, but your kind heart to all. 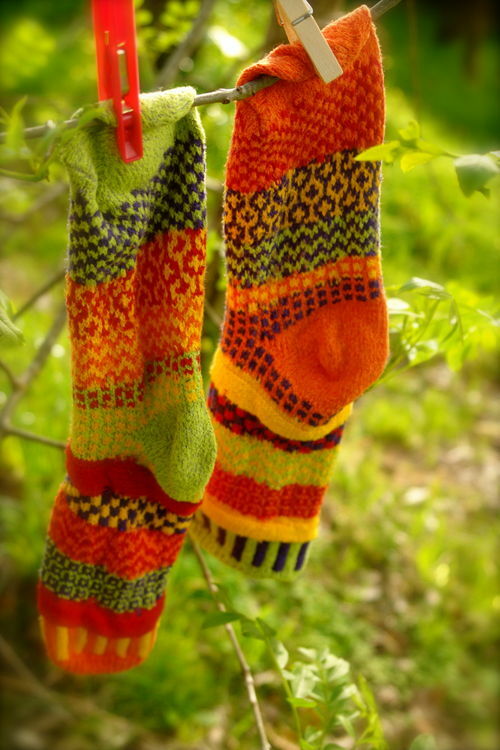 Love the Tilly video and can’t wait to see the socks finished. Becky, thanks so much. I enjoy sharing ideas with like minded people. My new blog format makes it much easier to post these days.